Turing - Morphogenesis (2012) is an acousmatic piece that conveys the propagation of unrelated sound entities anchored perceptually through the continued presence of their energetic characteristics. The compositional strategies were inspired by A.M. Turing's 'The Chemical Basis of Morphogenesis' (1952), where he mathematically investigates the onset of instability within 'morphogens'. In the case of Turing - Morphogenesis, the chemical agents that cause chemical morphogenesis are replaced by sound particles diffused into a 5.1 listening space. The sound material is derived purely from synthetic sounds calculated through a distribution of electronic audio signals using a specially designed max/MSP patch. The piece gradually creates an ontogenetic sound-world using an abundance of abstract computer generated sounds. As the sounds multiply, they begin to coalesce, emulating the complex behaviour of organic structures. Morphological inventiveness is formed through rapid gestures temporally articulated across a multiplicity of time scales. The creative catalyst for the composition was the interaction between computer and composer. The computer acted as the component in a complex system which intervened in a genuine polyphony of processes. Spatial awareness was promoted using a 5.1 loudspeaker array. Commissioned for the Turing 100 conference by Google, John Templeton Foundation and Artificial Intelligence. • Turing 100 Centenary Conference, Manchester Town Hall June 24th, 2012, world premiere. Video excerpts of the live performance1 and 2. •	MANTIS festival, the University of Manchester, UK, October 28th, 2012. 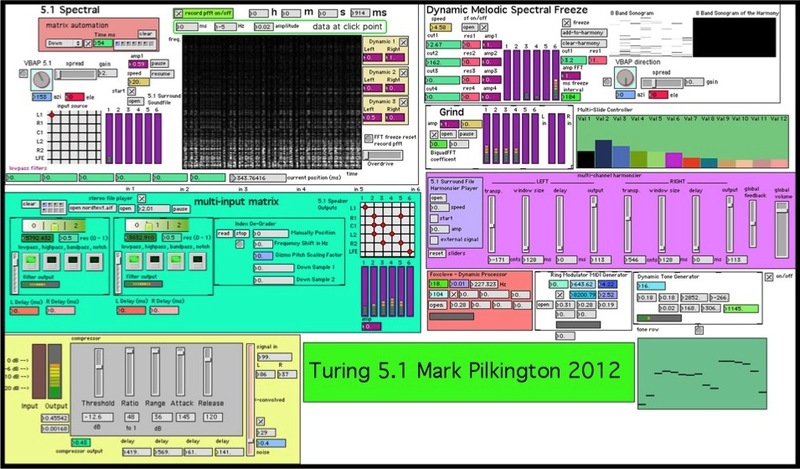 Turing - Morphogenesis - Stereo excerpt from 18'40 - 22'24, format .mp3.